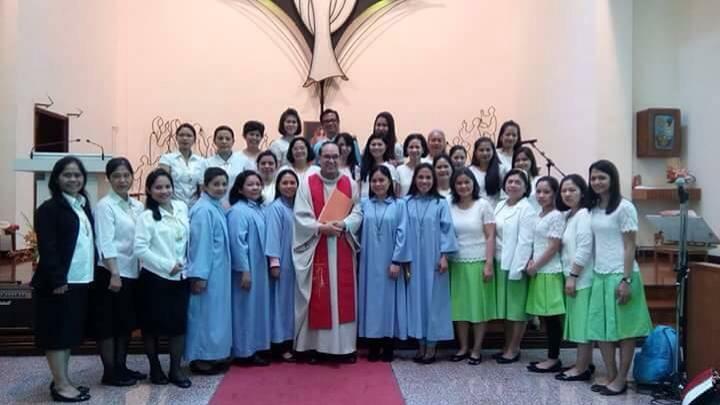 One in Christ Prayer Group ( Shatin ) was formed on 1 October , 1995 by Teofila Mariano and a Franciscan nun Sr Mary Cordero. For many years, Rev. Father Jay Francis Flandez, SVD, nourished the group with Bible study once a month. At present, the group consists of 35 members with 4 group officers. Rev. Father Jun Jacobe, OMI, is our group Spiritual Adviser and lecturer for the group’s Bible study . We gather together every Sunday afternoon to praise, worship and give thanks to God in our prayer meeting and we say the Rosary in honor of Mama Mary. Many of us also serve in the church as Lectors and Commentators, Extra-Ordinary Ministers, Ushers and Offering Collectors.